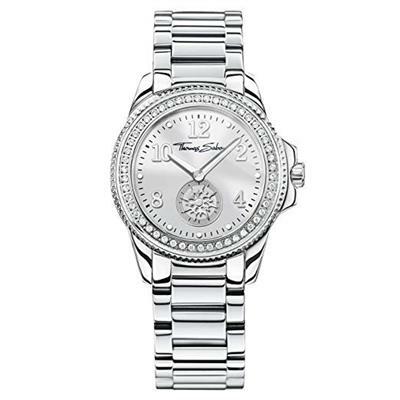 From Thomas Sabo is this stunning White CZ Sundial Watch. A perfect gift for her, and a perfect addition to any outfit day or night. This striking White CZ Sundial Watch 33m by Thomas Sabo features a mother of pearl dial, with a sparkling Cubic Zirconia detail around the edge. The elegant strap is made from stainless steel and white ceramic inlays. This watch would be a stunning addition to a glamourous outfit. This watch is crafted from Stainless Steel and White Ceramic. It features Cubic Zirconia stones and White Mother of Pearl.